Ma’amar Hametz. Halakhic precepts for the Passover and commentary on the Haggadah. 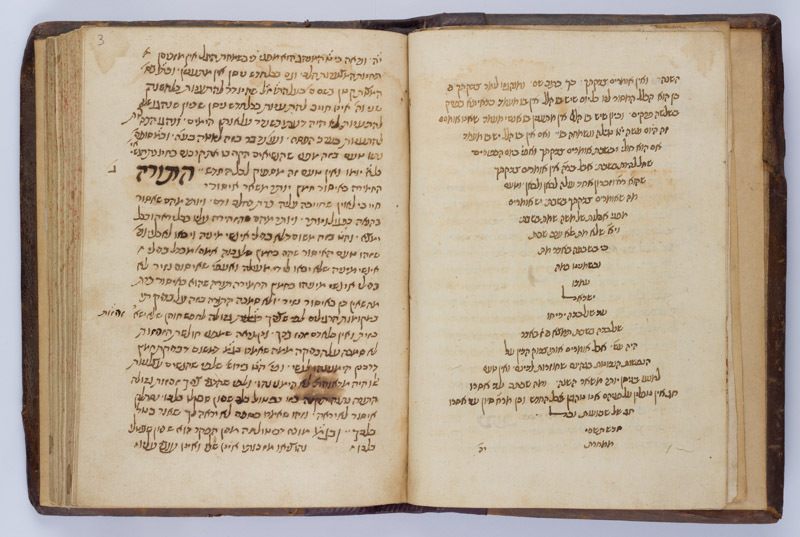 Ma’amar hametz, halakhic precepts for the Passover and commentary on the haggadah by Simon ben Zemah Duran (1361-1444) copied by Samuel ben Isaac ben Nono for his father Isaac ben Nono, 1483. Hebrew / Paper / 18,8 x 13,6 cm. / 79 ff. / Sephardic cursive writing, annotations in the margins in a later Sephardic cursive hand / Title written on top of f. 1r. / Editio princeps in Sefer yavin shemu’ah. Leghorn, 1744. Also on f. 79r laudatory poem for the author and the copyist in a different vocalised Sephardic cursive hand by Ibn Neroyo.